Boston Red Sox slugger David Ortiz has become the 27th player in major league history to hit 500 home runs. 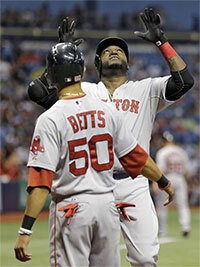 Ortiz reached the milestone with his second homer in Saturday night's game at Tampa Bay. He lined a shot to right center on a 2-2 pitch from Matt Moore leading off the fifth after connecting for No. 499 in the first.